The Eightfold Noble Path: Summary Text — The Contemplative Life. 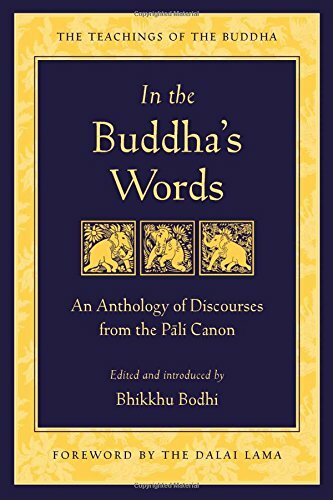 I found this text, which seems to sum up the Eightfold Noble Path, in a different collection by Bhikkhu Bodhi called In the Buddha's Words. I'm a little confused as to why I haven't seen this elsewhere as it gives a succinct overview of the Path. There are some details and elaborations missing (for instance there is no discussion of what constitutes "Right Livelihood" and no discussion of the immaterial jhanas), but overall I think it is a helpful text for putting it all together. 'And what, monks, is the Noble Eightfold Path? Right view, right intention, right speech, right action, right livelihood, right effort, right mindfulness, and right concentration. And what, monks is right view? Knowledge of suffering, knowledge of the origin of suffering, knowledge of the cessation of suffering, knowledge of the way leading to the cessation of suffering: this is called right view. And what, monks, is right intention? Intention of renunciation, intention of non-ill will, intention of harmlessness: this is called right intention. And what, monks, is right speech? Abstinence from false speech, abstinence from malicious speech, abstinence from harsh speech, abstinence from idle chatter: this is called right speech. And what, monks, is right action? Abstinence from the destruction of life, abstinence from taking what is not given, abstinence from sexual misconduct: this is called right action. And what, monks, is right livelihood? Here a noble disciple, having abandoned a wrong mode of livelihood, earns his living by a right livelihood: this is called right livelihood. And what, monks, is right effort? Here, monks, a monk generates desire for the nonarising of unarisen evil unwholesome states; he makes an effort, arouses energy, applies his mind, and strives. He generates desire for the abandoning of arisen evil unwholesome states... He generates desire for the arising of unarisen wholesome states...He generates desire for the continuation of arisen wholesome states, for their nondecline, increase, expansion, and fulfillment by development; he makes an effort, arouses energy, applies his mind and strives. This is called right effort. And what, monks, is right mindfulness? Here, monks, a monk dwells contemplating the body in the body, ardent, clearly comprehending, mindful, having removed longing and dejection in regard to the world. He dwells contemplating feelings in feelings, ardent, clearly comprehending, mindful, having removed longing and dejection in regard to the world. He dwells contemplating mind in mind, ardent, clearly comprehending, mindful, having removed longing and dejection in regard to the world. He dwells contemplating phenomena in phenomena, ardent, clearly comprehending, mindful, having removed longing and dejection in regard to the world. This is called right mindfulness. And what, monks, is right concentration? Here, monks, secluded from sensual pleasures, secluded from unwholesome states, a monk enters and dwells in the first jhana, which is accompanied by thought and examination, with rapture and happiness born of seclusion. With the subsiding of thought and examination, he enters and dwells in the second jhana, which as internal confidence and unification of mind, is without thought and examination, and has rapture and happiness born of concentration. With the fading away as well of rapture, he dwells equanimous and, mindful and clearly comprehending, he experiences happiness with the body; he enters and dwells in the third jhana of which the noble ones declare: 'He is equanimous, mindful, one who dwells happily.' With the abandoning of pleasure and pain, and with the previous passing away of joy and dejection, he enters and dwells in the fourth jhana, which is neither painful nor pleasant and includes the purification of mindfulness by equanimity. This is called right concentration.'"